Any guitarist after one instrument for almost any occasion need look no further. Ultimate versatility and fine build at a great price. With three different pickup types, it has something of the 'kitchen sink' about it. British guitar ace has Geoff Whitehorn has teamed up with Trev Wilkinson's Fret King brand to produce one of the most sonically flexible signature guitars we've ever heard. Geoff Whitehorn is one of the UK's most musical players. You may have caught him demoing at trade shows, seen him in a variety of bands in which his superb taste and tone are sought - Family's Roger Chapman, Procol Harum, Roger Daltrey, Elkie Brooks to name but a few - and almost certainly heard him on record without even knowing it. Geoff's schedule requires him to fly around the world at a moment's notice, and to come up with the sonic goods in whatever scenario he finds himself. Since he has long been an admirer of Trev Wilkinson's work, the two have been collaborating for a while, and you can see the latest fruits of their labour in Fret-King's Black Label Corona GW. As a lover of both humbucking and single-coil tones, but increasingly favouring the double-cutaway style of guitar, Geoff had a simple requirement for his signature model: an S-style instrument that played great, with as many usable tones as possible. "The P-90, single coil and humbucker setup may seem like a dog's dinner, but Pedigree Chum isn't on the menu"
What he and Wilkinson came up with might at first seem like a dog's dinner of a setup: P-90 at the neck, Strat-style single coil in the middle and humbucker at the bridge, with even more options courtesy of push-push tone pots. In practice, however, Pedigree Chum is definitely not on the menu. The instrument chosen to bear all this gadgetry was the Black Label Corona, a guitar we like for its build, playability and value. Although the regular Black Label Corona is already well equipped with a modern American alder body and Canadian maple neck, Geoff swapped its knife-edge bridge for something more vintage styled here, in the shape of Wilkinson's WVS vibrato. The complement of 22 medium jumbo frets on a rosewood fingerboard remains, as does the attractive batwing headstock and squiggly scratchplate. Tuners chosen for this model are Wilkinson's simple and sensible E-Z-Lok. 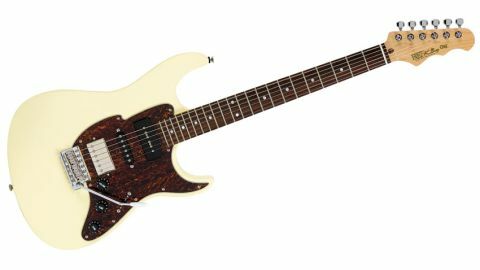 The GW feels like any good modern double-cutaway bolt-on: its flatter-than-vintage fingerboard radius, slightly larger frets and low-slung action are unlikely to cause a sweat, whatever style it's called upon to perform. Electronically, the Corona GW is much more interesting. In a bolt-on design guitar, Whitehorn prefers a neck P-90's wiry blues voice over a potentially mushy humbucker in this position, and we agree. Add the Prizefighter bridge humbucker and WHS centre single coil and the potential is clear. This is further emphasised by push-push switches on the tone pots (one for neck and middle and a dedicated one for the bridge); the bridge's tone switch splits the humbucker, but push the middle knob, and this pickup and the P-90 come on together. With the five-way pickup selector in position two, all pickups could conceivably be on at once. "Whitehorn has famously said of his Corona that if you can't find the tone you're after, it probably doesn't exist!" On its own, the humbucker is strong and dark, and perhaps more articulate than a Les Paul's due to the guitar's construction. Split it and it's not quite Strat and not quite Tele, but pleasingly twangsome nonetheless. The middle pickup is for those cleaner Hendrix or SRV moments, since these never really dirty up that well, while the neck P-90 sings however you set it - clean, it's fat but distinct; distorted, it roars like a beast! The two in-between tones - positions two and four on the selector-are fatter than your average Strat, for obvious reasons. As Geoff says, Tele-ish or 335-ish tones are available depending on whether the humbucker is in split or twin- coil mode. Both tones are ideal for funky rhythms or cleaner blues leads. The 'all pickups on' option is like a bigger version of neck and middle together, and works a treat for huge distorted Brian May-style chords. Trev Wilkinson has met Geoff Whitehorn's request for the ultimate in versatility in typically practical style. While those three very different-looking pickups might not be the greatest treat for the eyes, it's what they do for the ears that makes this guitar special. We've always known that the Corona works - especially this value-laden Black Label version made in Korea - but Geoff and Trev's clever tweaks have made the GW potentially the hardest-working one yet. Whitehorn has famously said of his Corona that if you can't find the tone you're after, then it probably doesn't exist. That's not so far from the truth, so if you're a busy travelling musician, a budding sessioneer or even in a good covers outfit, the Corona GW will do it all, no problem.